Today I am delighted to announce the release of my new pattern: Susurration socks. This pattern came about as a collaboration between me and my friend Fay (Bea and Rose), an indie dyer local to me who creates beautiful colourways: think deep saturated colours with plenty of speckles. A few months ago Fay suggested we work on a collaboration together, and this is what we came up with: the Susurration socks. 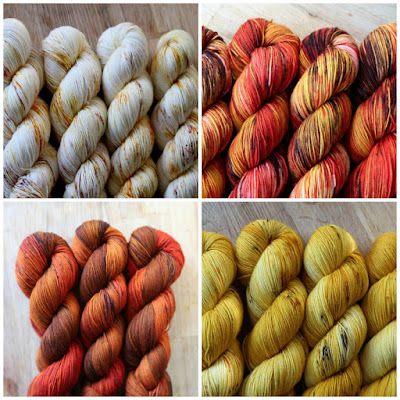 Fay has dyed up amazing rich autumnal shades that echo the colours of wheat fields, a theme that is reflected in the lacy wheat stitch pattern that makes up the central panel of the socks. I came across the slipped-stitch textured stitch pattern in a stitch dictionary under the name grass stitch, which tied in so beautifully with the theme I couldn't not include it! Why Susurration? Susurration means 'whispering or rustling', which makes me think of the sound of wheat ears rustling in the wind. The Susurration socks are knitted using my favourite toe-up construction with a gusset and heel flap shaped with short rows. The socks have a pattern on the instep and around the leg, while the sole is knitted in stocking stitch. The gusset length is affected by your row/round gauge, so a table of gauge-dependent lengths is included to help you achieve the perfect fit. I've written the pattern in three sizes (finished sock circumferences, 16 (20, 23.5) cm [6.5 (8, 9.25) in]), to ensure you can make perfectly fitting socks. When choosing which size to knit, choose the size that is approximately 2.5 cm [1 in] smaller than your foot circumference – socks are stretchy and negative ease helps the socks to fit properly. The pattern is needle-neutral and can be knitted on any of DPNs, short circulars or long circulars using the magic loop technique. The socks are shown in a sample of Fay's 4 ply sock base (4 ply; 425 m [463 yds] per 100g skein; 75% merino wool, 25% nylon). The yarn is a merino/nylon blend that is perfect for socks with the softness of the merino yarn being strengthened and stabilised by the addition of nylon. The sample socks shown are the medium size for a UK size 6 foot (foot length 24 cm/9.5 in) and used 330 m [357 yds] of the suggested yarn. As ever, if you'd like to share your progress, create a project page on Ravelry, or post a photo to Instagram and tag me (@vikkibirddesigns). In addition, Fay will be running a knitalong for these socks in her Ravelry group until the 1st November 2017. Head over to the thread to join in the fun and be in with a chance of winning a skein of her hand dyed yarn and a project bag. *Your discount code will be included on the final page of the pattern. Just open the pattern pdf when it arrives to find your code. Codes will be valid until 11.59pm BST, Tuesday 17th October 2017. Fay ships internationally and has a beautiful selection of yarn. 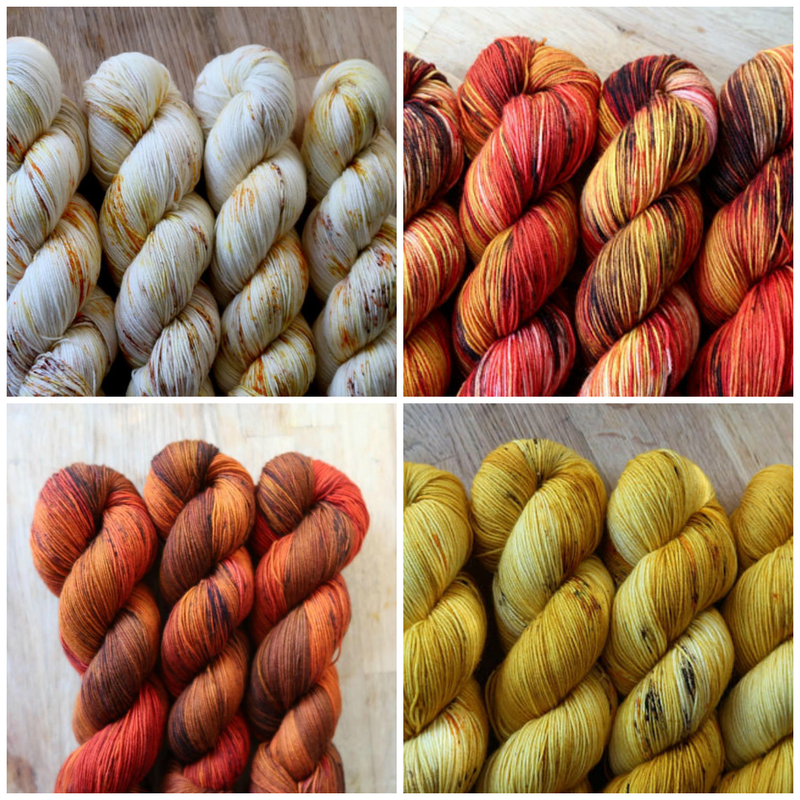 Some colours have been specially dyed for the socks but the discount can be used on any product (excluding yarn clubs). **Colourway photos are copyright Bea and Rose.